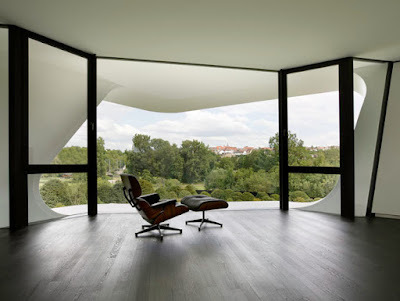 Minimal Modern White Panton Chair House with White Verner Panton Chairs - Dupli Casa, a private residence by the Neckar river, near the old town of Marbach in South- Western Germany, is a wonderful example of connection and fluidity. It connects the inside with the outside, up with down, air with ground and - most cleverly - past with present and even future. The geometry of the ultra modern Dupli.Casa is based on the footprint of a house that previously was located on the site, originally built in 1984 and with many extensions and modifications since then. The new modern architecture building echoes the "family archeology" by duplication and rotation. Lifted up, this modern home creates a semi-public space on ground level between two layers of discretion. The spatial configuration of the modern villa performs a sophisticated connection between inside and outside and offers spectacular views onto the old town of Marbach and the German national literature archive on the other side of the Neckar valley in Germany. From the outside, the three-story concrete villa looks like a bit like some sort of a fiberglass motorboat job gone funny, yet it also manages to look immensely appealing and intriguing. From some angles, the structure appears to be standing upside down - the lower exterior rim spilling onto the lawn and forming a part of a roof structure, if the building were to stand the other way around. It could have been blown there by the wind; it could be a Space Age vehicle frozen in place; it could be just taking off to outer space. 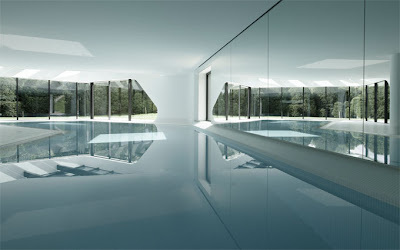 The outdoor swimming pool and the white surface surrounding it seem like a perfect reflection of the house, almost as if the house had been face down on the ground, and when it was lifted off the ground, the process had left an imprint of a swimming pool on the ground and the large window opening in the house.